I hope you had a chance to read my introductory article about Yellowstone! Are you ready for day 2? If you haven’t already, read what we did on Day 1 in and around Canyon Village. Today we packed up everything because today we will make our way to our next stay. I sure will miss our little cabin on the lake! We started at the west entrance to Yellowstone. Our morning will be spent in the Old Faithful Area with a few stops on the way. 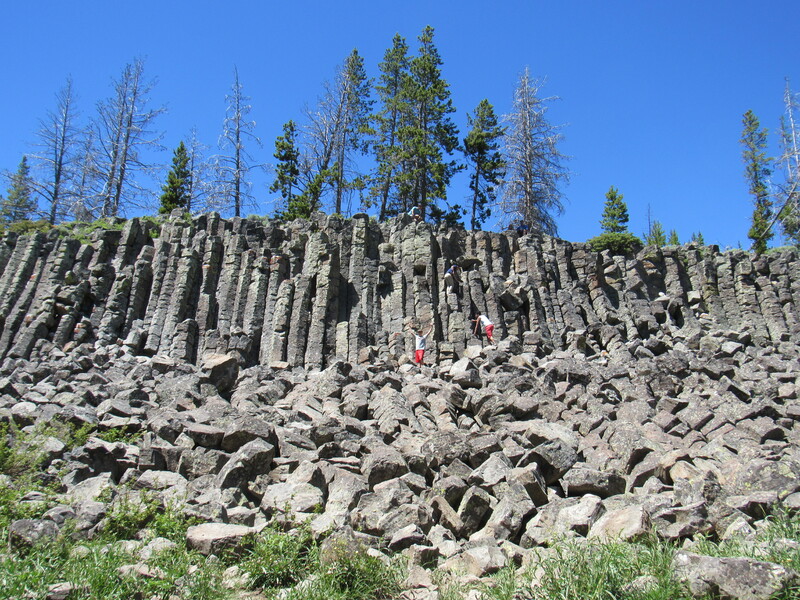 On our way, we found the Firehole Canyon Drive just past Madison. 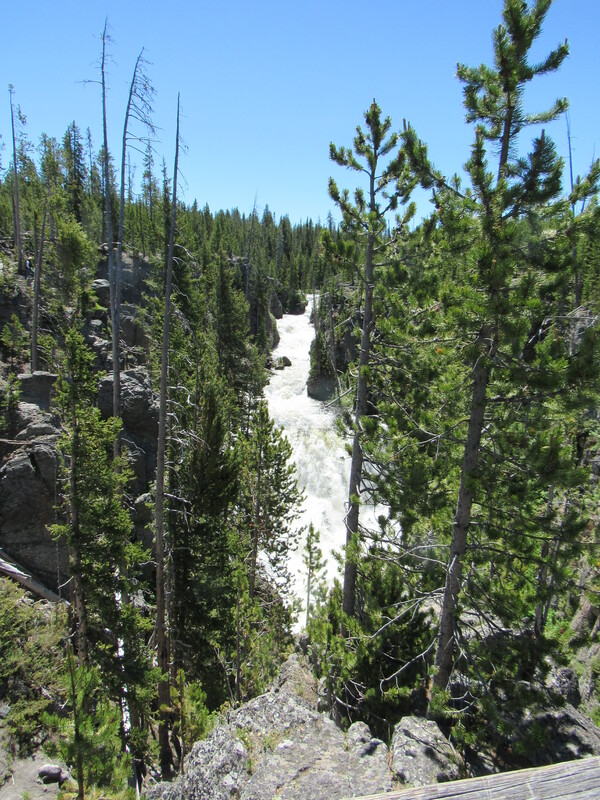 This was a narrow, one-way scenic route that passes by the stunning Firehole Falls. There’s a small area to pull off so you can get some pictures too. It’s on your way, so it’s a nice alternative. stop here, even before visiting Old Faithful because it gets busy, and it already was in the morning. We walked along the boardwalk and I was in awe of all of the amazing colors. Definitely worth the stop! Now it was time to visit Old Faithful and Geyser Hill. When you arrive, you can check the schedule to see when Old Faithful is expected to erupt. They can predict this within a 10 minute time frame, and it’s about every 90 minutes. It’s the only geyser that is that predictable. We decided to grab a seat and wait, because it would be within a 1/2 hour. There are plenty of benches, but it really fills up fast! While we waited, we could see other geysers in the Basin erupting in the distance. Once Old Faithful put on a show, we walked around Geyser Hill and saw some amazing things!! After our picnic lunch, we stopped at Kepler Cascades. There is a viewing platform at this overlook that takes you above the river for a straight on shot of the waterfall. We started to make our way north to Gardiner. This is about a 2 hour drive, so we made some quick stops to break it up. 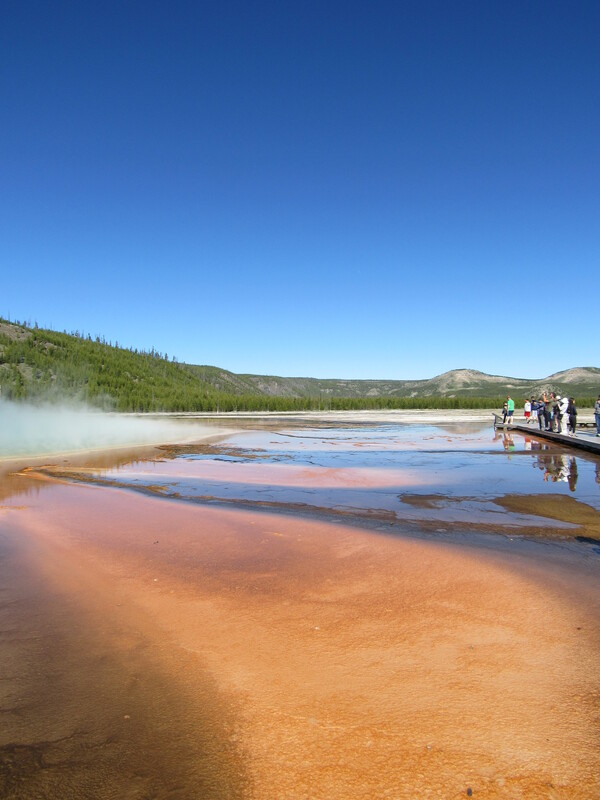 We took a quick drive on the Firehole Lake Scenic Drive and saw an amazing landscape with lots of different geysers. A quick selfie at Roaring Mountain was a must. As we continued to drive, we came across Sheepeater Cliff. People were climbing the cliff, and Preston climbed about halfway. He wanted to climb all the way to the top but I know he would’ve been scared to come down. He is scared of heights…but it looked like an easy climb. Right before we made it to the Mammoth area, we made a quick stop at the Golden Gate which provided spectacular views with a beautiful waterfall too! 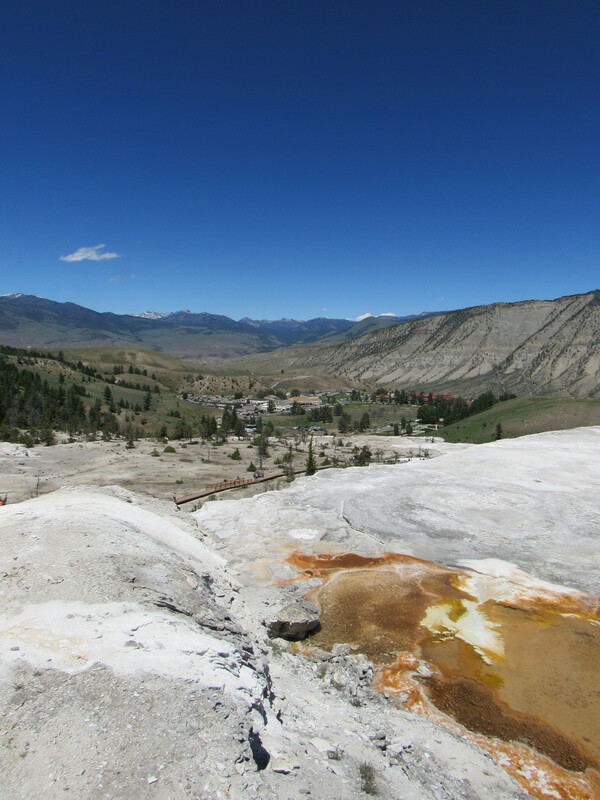 We took the drive through the Upper Terrace Drive which gave us an amazing view of Mammoth Springs. 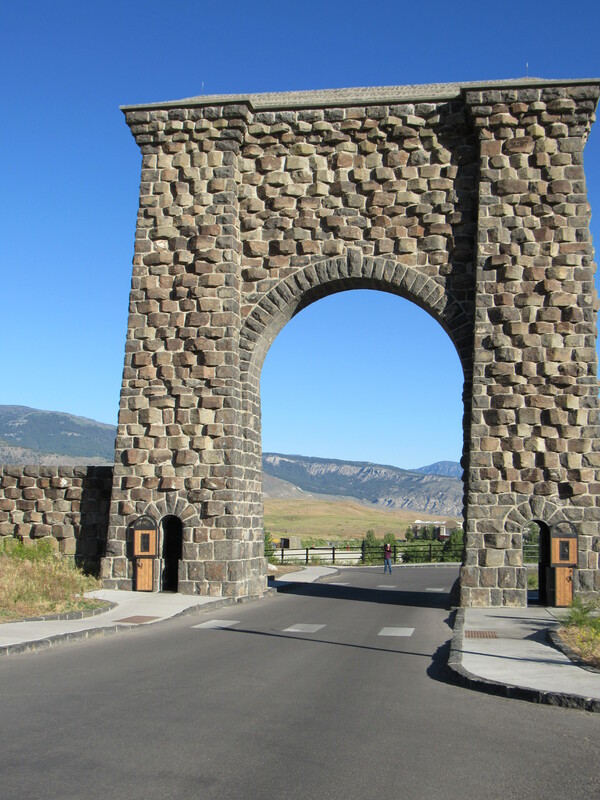 We arrived in Gardiner by driving through the Roosevelt Arch. After we got settled in to our hotel, we found a cute drive-in Corral Burgers for dinner. Are you ready for Day 3, we are heading to Lamar Valley for some animal watching?